Between the peanut blossoms and the fudge, the hot chocolate and the pumpkin cheesecake, I need a lighter meal more than ever during the holiday season. Something vegetable-packed and light, but still deliciously rich tasting and filling. This year that need is being met by this soup. There are so many vegetables in it that I added an extra veggie to the name. Don't think, though, that this is a bland or boring dish. It is different from any other vegetable soup I've made, mostly because there is no single flavor that is overpowering. 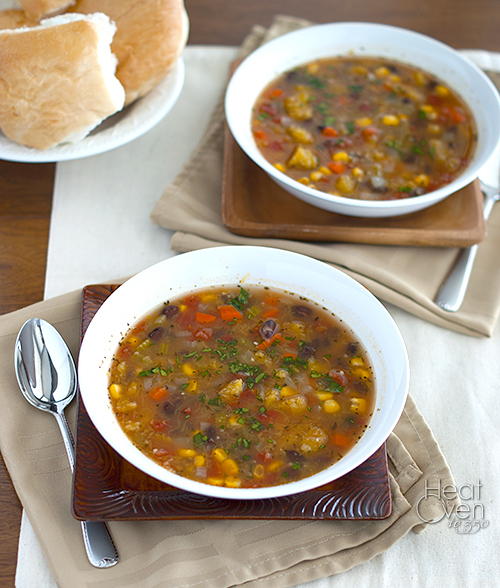 There are just enough tomatoes, just enough corn, just enough black beans, squash, celery, garlic onion and carrots to add their own unique flavor without taking over the soup. 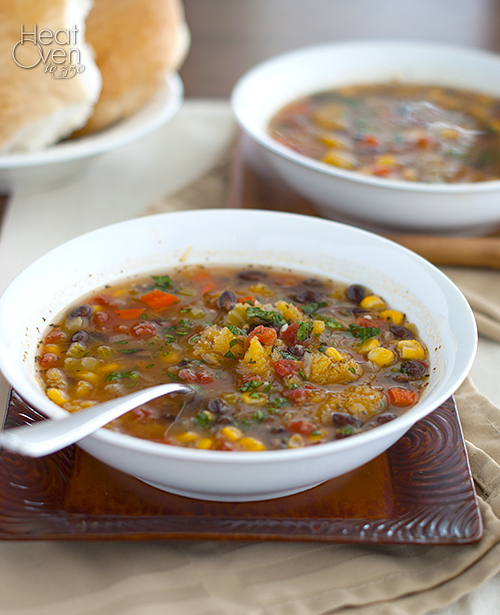 And with so many vegetables packed into it, this soup is thick and hearty. It leaves you feeling warm and full, like any good soup should. I love the sweet flavor that that corn and squash add, and the texture of the carrot and celery pieces. It all blends together so well and so deliciously, I would eat it even if it weren't good for me. Luckily it is one of those rare meals that is both tasty and healthy. It's a welcome break from all the rich food of the holiday season, or anytime in the year you need a rich, delicious, veggie-full dish. Cut the squash in half and pierce the shell several times with a sharp knife. Place face down on a microwave-safe plate and add 2 tablespoons water to the plate. Microwave on full power for 6-8 minutes or until squash is tender enough to scoop out. Set aside. Heat oil in a Dutch oven. Add the onions and cook over medium heat, stirring often, until golden, about 8-10 minutes. Add the carrots and celery and cook 5 minutes. Add the minced garlic and cook until fragrant, about 1 minute. Add the vegetable stock (or chicken broth, if using) to the Dutch oven. Scoop the cooked squash in small spoonfuls out of the shell into the Dutch oven. Add the tomatoes, corn, thyme, marjoram, basil and black beans and bring soup to a boil. Reduce heat and simmer, stirring occasionally, until carrots and celery are tender, about 15-20 minutes. Add pepper and salt to taste (usually about 3/4 - 1 teaspoon) and stir in fresh parsley. Serve. That looks so good Nicole - love all the veggies packed into this one! Yum! I moved to Texas to escape the cold and it followed me. So, I am all about soups right now. This looks great! This sounds like the kind of soup I would love to have this instant! Love veggie soups, especially when squash is involved. Pinned! Thanks for sharing your lovely recipe.